Ghassan Kadi's reflections on the terrorist crime that happened in New Zealand. 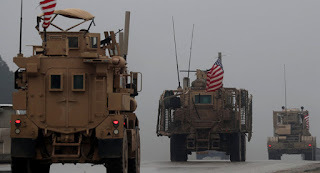 *Note: This was published a while back on Facebook and poses some important questions about some of the interesting characters who turn up in Syria and I decided that I am going to share it on my blog. The research was done by an excellent forensics person. On a personal note I am unhappy with Mr Tom Duggan who, despite being married to a Syrian, and who merely resides a short walk from some of my family which includes a member of the SAA, he has never apologized for allowing/posting in the group he manages “Syria-Between-the-Lines”,insults, lies and defamations against the well known Lebanese-Syrian writer and analyts Ghassan and myself. Shockingly, this is a man who claims to be a journalist and a “comrade-in-arms”, but broke the protocols and ethical code of conduct of journalism by allowing or actively playing a part in the revealing of indigenous activists and their families real names, people from the region embroiled in war, who have families in Syria and Lebanon, and who like most from the region, particularly in the earlier years of the war, used pseudonyns for safety and ability to express very dangerous topics not just on Syria but on the neighbouring states who no doubt now have our names listed. 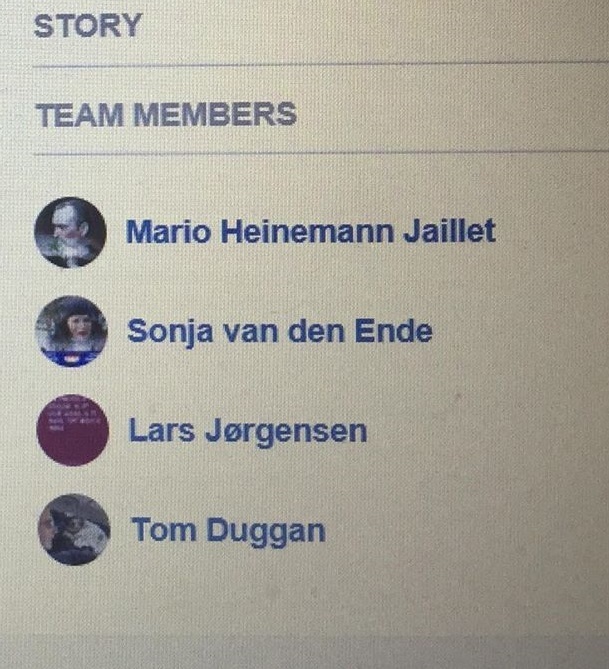 Duggan allowed or actively engaged in the publishing on his FB page our real names, our photographs and twisted, defamatory statements about us. We were there to defend Syria BEFORE the war started, Ghassan's family defended and honoured Syria since the 1950's and suffered immensely in their work for Syria. Our family are shocked that this man, a man married to a Syrian, could have done this to us. Does his Syrian wife know that he has insulted members of a patriotic family who not only have been activists and writers but financially are there for Syria since the beginning of the war? How does she feel about her buffoon, rude husband doing this to us? And yes, who is this "International Man of Mystery" who I agree is illiterate. Tom Omar Duggan :International Man of Mystery. Created in Mannheim, Packed off to Syria. 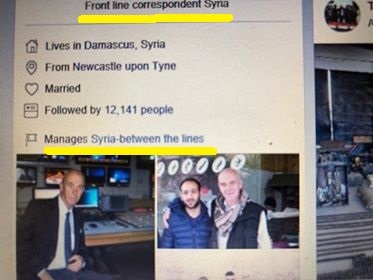 Google the man and descriptive suggestions for further searches follow; “independent Journalist”, “British Journalist”, “UK Journalist”, “Syria-based journalist”, “English Teacher” and so on. But, there is no trace of this man being a journalist or anything! He, like Rick Sterling, is a man who came from nowhere. In aeronautical engineer Sterling’s case he was for 20 years “in Africa”. Duggan’s identity begins in recent times in the UK City of Sunderland, or so he says. He indicates he worked in the modelling industry as a photographer and that he “discovered models”, but there is absolutely nothing there to find apart from some posts in one of his Facebook profiles that have been backdated. 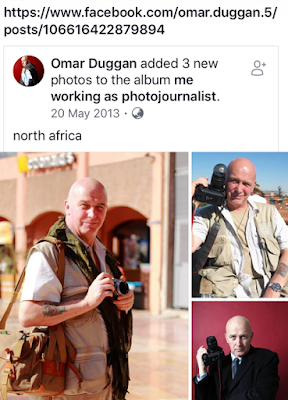 There are staged-looking shots of himself in Africa carrying cheap photographic equipment. 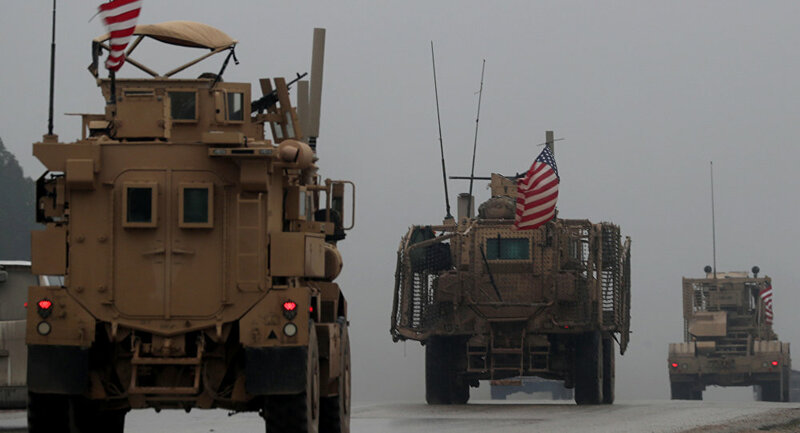 Were the war on Syria not such a serious subject, we’d say he just a little boy in an old man’s body, living a fantasy. 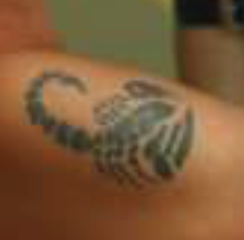 His tattoos and demeanour suggest an early career as a lowly conscript in the British Navy. He has the English of an uneducated, almost illiterate, simple man, yet presents in Syria as a journalist. 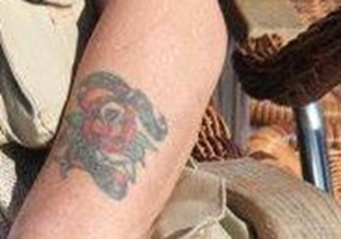 His first job in Syria is that of an English teacher who loves “litriture”. 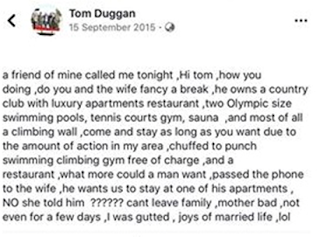 Almost every sentence Duggan writes is of such calibre. His speech is similar. He flirted online with women, hoping for luck in North Africa before he even though of Syria, or is it till someone thought of Syria for him. A different lady to marry than one a few months later! 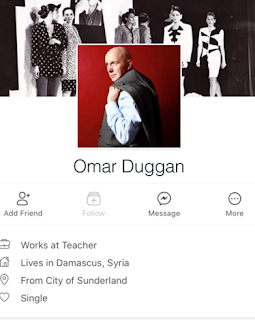 Using a profile named “Omar Duggan”, he either caught or made it look that way, a Syrian lady, apparently a lawyer based in England. 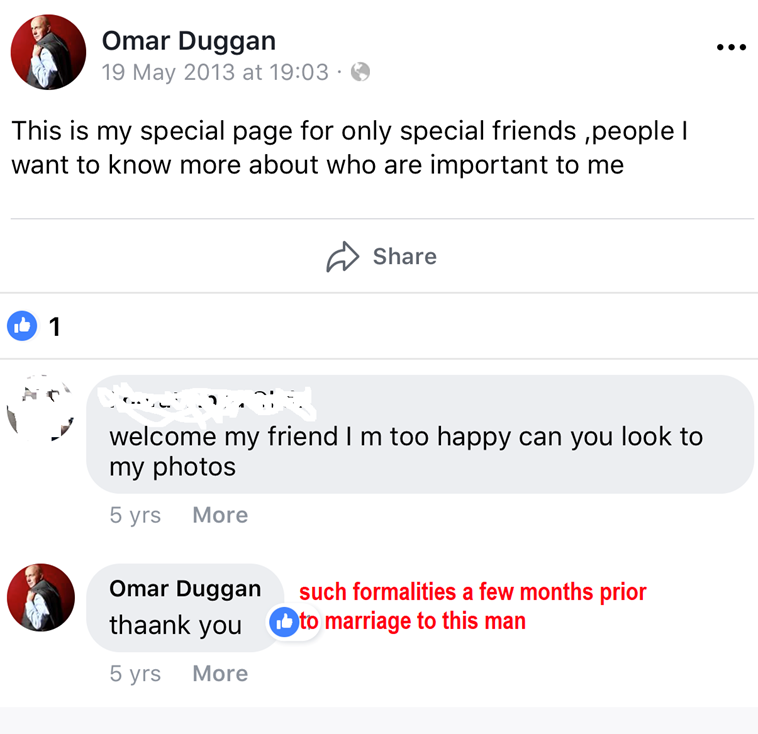 In May 19 of 2013, his wife-to-be says on her FB page to Omar/Tom "welcome my friend I'm too happy can you look to my photos". Interesting language for a British Law Graduate and many more such examples abound. They married shortly afterwards. There are no signs of courtship. 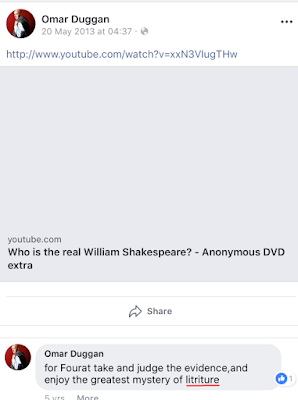 The wife is perhaps from a wealthy family. Friends call them to have a break from the bombs and stay in their multi-million dollar resort in Syria. 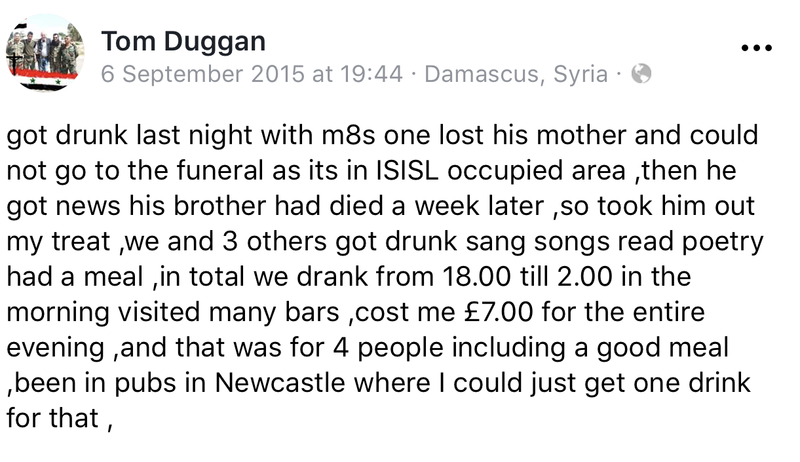 1 Dec 2013 Duggan announces he moved to Syria and teaches English, despite his poor English. He arrived via Lebanon on a Tourist visa; that is another version of his story. He says he has work in the fashion industry in Lebanon. 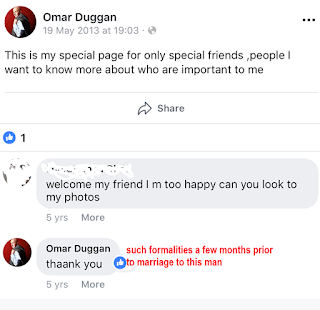 His “Omar” profile he uses there says he is single. 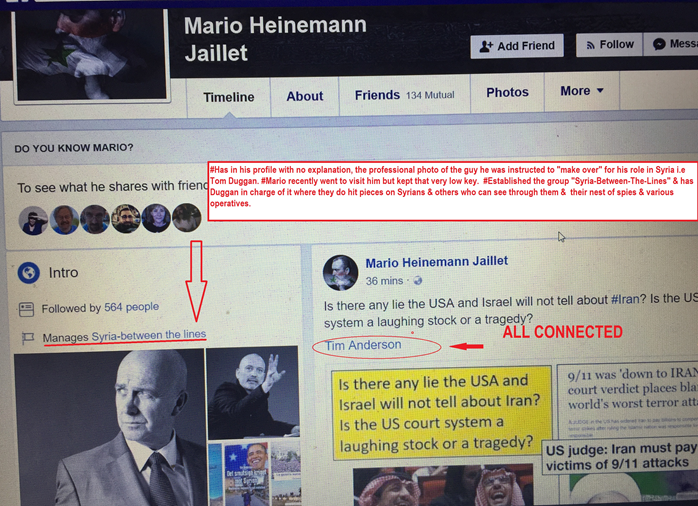 Note his uses his “Mannheim” photos where his character is created. In the early part of their placement in Syria, late 2013, they are very low key. Duggan teaches Syrians to be more illiterate in English than he is, that’s his employment in Syria. Suddenly Duggan he bursts onto the scene in 2015 with photos and videos. 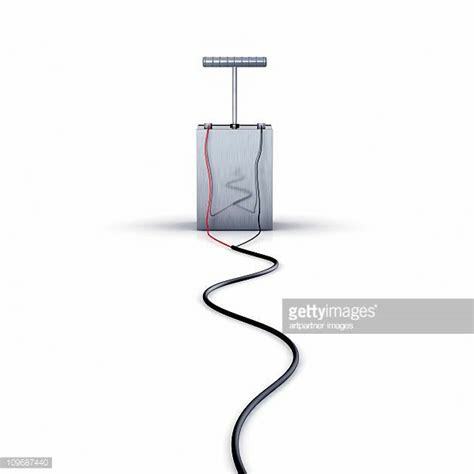 It’s all of a sudden lights and camera, and he gets in contact with the usual suspects we’ve been watching, boasts of being associated closely with Bartlett, Beeley and her UN connections, and tells everyone he is setting up a TV station in Damascus, getting assistance for a studio perhaps due to his wife’s powerful connections, and seeking donations for equipment. 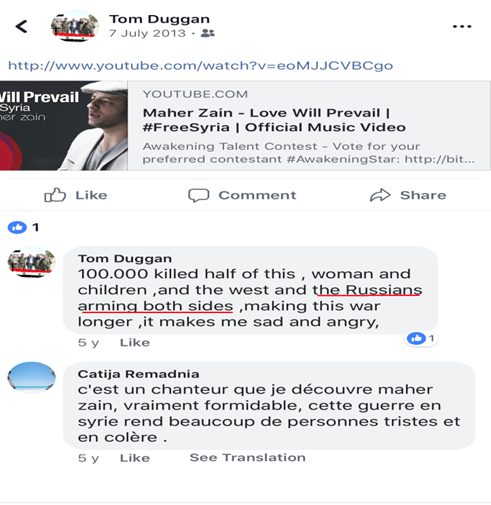 Despite Duggan being right next door to RT TV in Damascus, he puts on his VK page that he has links to models, but needs to get Russian media contacts! 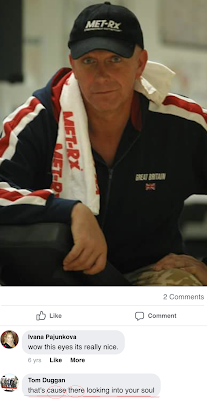 This late aged “British Journalist”, who should be well established decades ago, asks for money to set up his media place, giving his Florida contact’s bank account details. Naturally this International Man of Mystery, concocts a plan to access the most sensitive war zones in the country, nothing is an obstacle. It seems Beeley, Bartlett, Anderson, Kortkamp etc., decide eventually to keep a bit of distance from this fellow. RUSSIANS ARMING BOTH SIDES? REALLY DUGGAN? 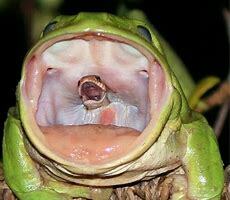 ...AND THEN YOU GO HERE? This character who needs elocution lessons, boasts that he advises Syria’s Foreign Minister. He’s already had his people in Mannheim organise photos of him, and dress him up as if it’s some James Bond movie production. From the UK Navy to the NATO boys in Mannheim? Is that a possibility? The guy looks so simple and harmless, who would ever think anything of it? 17 July 2015, he’s got his photos made in Mannheim, Germany, he is ready for his mission, and posts them on his profile as does his German associate. 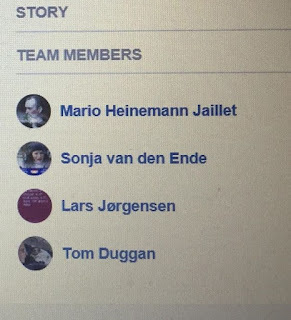 We see early evidence of connections to the troll army of fake Syria supporters. In late August 2015 he starts to post on Syria regularly. Meet Mario, the professional Mannheim make over man who got him ready. Also uses his group to abuse patriotic Syrians, their family members and others from the Levant. 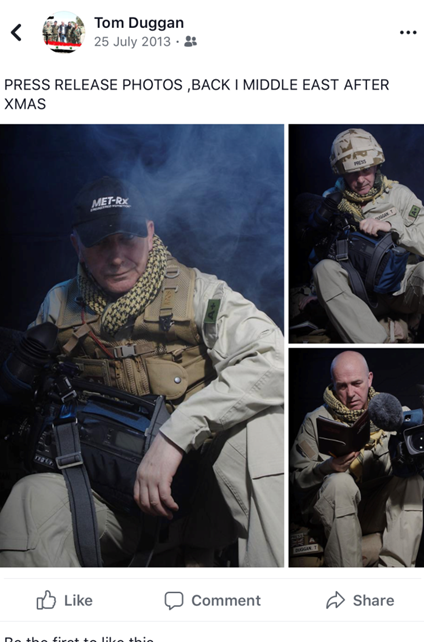 Dutifully, Duggan manages Syria-Between-the-Lines, the hit page on patriotic Syrians and others from the region. 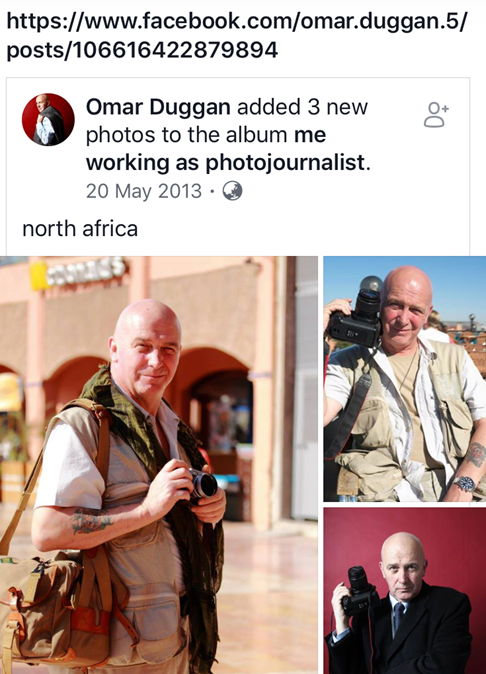 By 2016 Duggan has connected with the fixer, the “can do anything for a price” man, Qusay Khamis, who introduces Duggan as the "adviser to the Minister for Foreign Affairs". 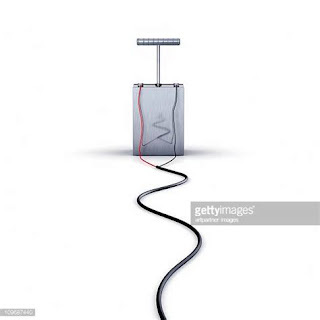 Khamis had to suddenly leave Syria after receiving electronic equipment from Rick Sterling among other matters. He promptly met Sterling, Larudee and Andrew Ashdown in Lebanon and then few off to Khartoum for at least a week, staying at a $US365 per night room (Rotana), bought a $US4000 camera and told friends he had been flying all around the Middle East and parts of Europe in recent months and that he was meeting a British person at the hotel. He may still be hiding out in Beirut, hanging with Sahiounie’s son who is stuck there too. In July 2017, Duggan complains about Sinan Saeed, someone he did work in Aleppo with and wants anyone connected with him to unfollow him. Isn’t he just a typical greedy fixer? 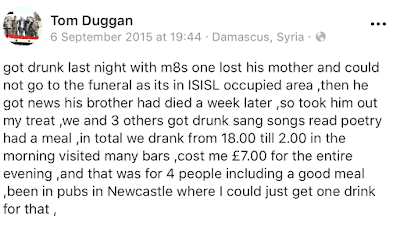 He boasts about getting drunk in Syria with some friends. He lives in a fantasy world and the Brits found a use for him. Welcome to the International Man of Mystery! 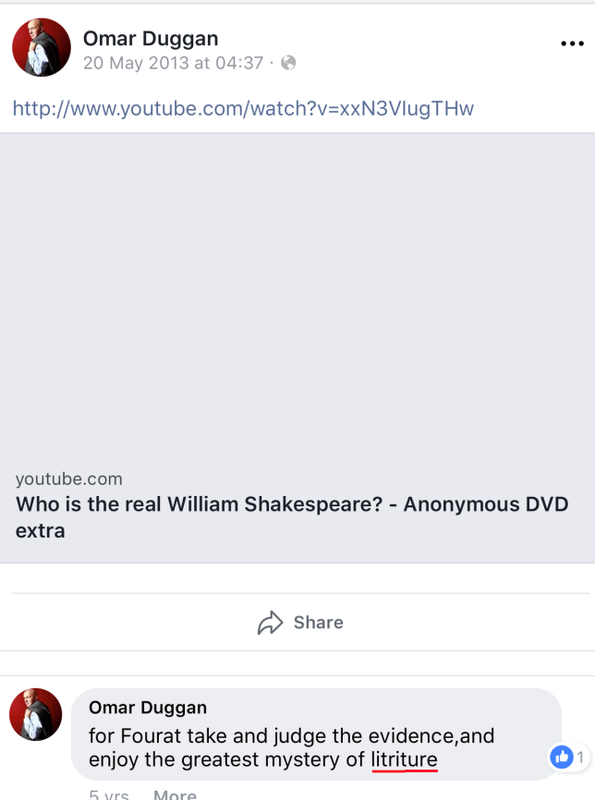 Getting back to literacy issues; we’re so lucky to have this teacher and journalist who can’t speak properly, put a proper sentence together or spell. And look! 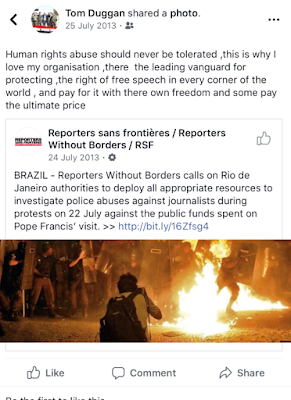 He is part of Reporters Without Borders he says! Right! And he loves “litriture”. We could speculate here. The Fantasy World of International Man of Mystery could make him susceptible to being at the service of Gladio Ops. Here is a most likely one with him. As Fetullah Gulen (CIA ) states to his followers "you must work into the arteries of the system until you reach all power centers ". 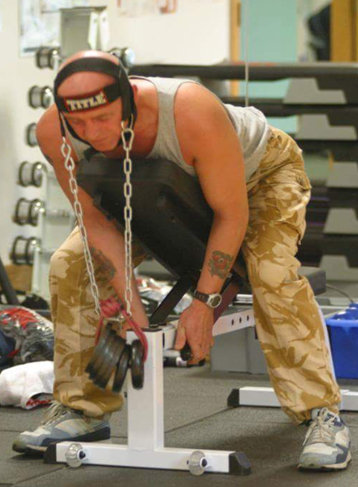 And so they did in 140 countries using the same methods as this guy. You trap people in webs by patiently weaving a web. Gulen speaks of his interfaith dialogue groups worldwide as spider webs. From Fatigues, to Press, to suits via Mannheim, Germany project briefing with his cover organiser Mr Mario Heinemann who of course recently showed up in Syria. His group “Syria-Between-the-Lines” is the most vicious in attacking Syrians and those from the region who are exposing these infiltrators. Mario likes to speak for Syrians. He plays his part in this large network. Ghassan and Intibah Kadi look back with a slightly different take on what Syria achieved. Ghassan Kadi was interviewed by Sputnik about Trump and his statements/intentions about Syria. Remember, the whole region is a small area, and no one can use “nukes” in the region without it being detected and affecting their neighbours and that includes the pariah state of Israel. We’ve had other silly stories promoted by opportunists and businessmen about “Israeli nukes in Yemen", portraying that pariah state as powerful and fearsome. 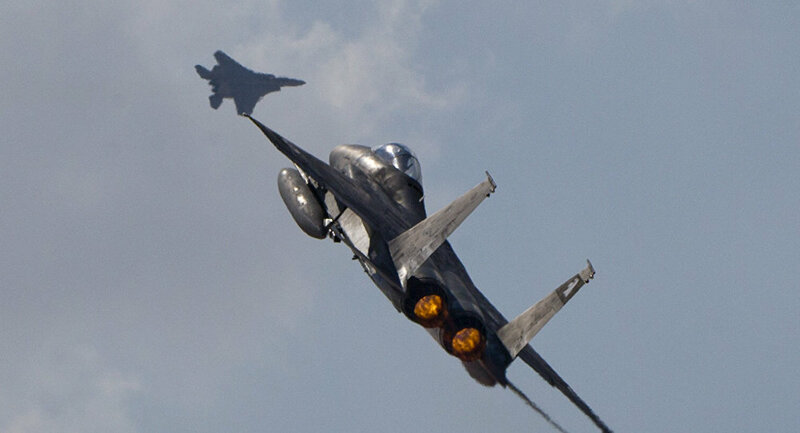 The Israeli’s might tease the Saudis with talk of selling them such information but I think they will never do it because they don’t trust them and can’t control what happens with it after that. The two, on a temporary basis, collaborate on many evil things as we know, each meeting their own wicked agenda in a sick win-win scenario. But, on such a matter as nuclear, I believe Israelis won’t do that. Now remember in the Middle East region an old sectarian crack was seriously stirred up in the last decades with its earliest manifestation occurring in the times of the Umayyad with a fairly quiet stand off since that time. If Israel is promoting this story, as it seems it is, it would be to add further fuel to the sectarian fire in the hope that in time their neighbours will destroy each other without Israel having to lift much of a finger. Pakistan’s Ali Bhutto, in 1974, went to Saudi Arabia and told the King that the Israelis with their nuclear arsenal were threatening Saudi Arabia and Indians with theirs were threatening him and hence, both were threatening the Muslim world. He asked the King to give Pakistan money to develop nuclear capability. Apparently Bhutto said this technology would then be shared with Saudi Arabia. Pakistan received billions from the Saudis for this project. But, the Pakistanis apparently never did share the technology. I think that for a country to have nuclear weapons, unless they are tied at the hips with a big nuclear power like Israel is to the USA, the weapons are developed fairly independently as no other State will hand over that entire technology to another. The Saudis have the mindset that anything can be bought, but they themselves are the problem and not even their Pakistani brothers want a part in this let alone a Zionist state that has temporary partners of convenience in the Muslim world.